Hieu Ngoc Ma, commonly known as Tony Ma, was born in Vietnam on November 30, 1957. He fled Vietnam in 1985, and travelled a rough road, seeking asylum in the United States. Tony Ma worked as a welder and a truck driver, but also played the games of paigow poker and dominos. He also started playing poker shortly after his arrival. 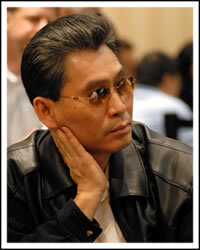 Tony Ma became well-known in the California card rooms, and in 1996 he had his first major success. In 1996, Tony Ma won the $5000 Limit Holdem Event at the World Series of Poker after refusing a final table deal. He then went on to defeat John Bonetti, Johnny Chan, and T.J. Cloutier to pick up the first place prize of $236,000. In 2000, Tony Ma won his second WSOP bracelet playing in the $2000 Limit Holdem event. Tony Ma made it to the final table of the World Poker Tour’s first season Pro-Celebrity Invitational Tournament, finishing fifth. Tony Ma has not won a WPT event, but has finished in the money seven times total. In 1999 Card Player Magazine named Tony Ma its Player of the Year. Tony Ma has had a lovable poker career, with his WSOP & Circuit Earnings totalling to around $1,310,639, as of 2013. Summing it up, Tony Ma has made more than $4.2 million playing poker. Tony Ma currently resides in South El Monte, California with his wife and two children. He enjoys singing and dancing and says that he became a better poker player by watching the poker players who were better than him.